..... Balance Trading .....: The Mother of All Bull Markets? S&P500 (SPX) has risen about 53% since March lows. Except for the financial sectors, there are no other sectors matching the performance of that index. I think this occurrence, namely SPX out performing all but one or two sectors in the course of last six months, is unprecedented in the last 30 years. I find this puzzling and can't find an explanation for it, except that SPX (and other major indices) are artificially pushed up in hope of making the market participants (namely baby boomers) more confident about their financial outlook. Without that confidence, the US economy is doomed and could spiral back down into a very deep and long recession or possibly a depression. The fear of a depression substantially out weighs any near or immediate term inflation concerns, hence justifying flooding the economy with more and more money. I think this policy which was put in place in late 2008, will be continued for the foreseeable future. There is no other option, at least no relatively painless one. "Trend is your friend", and this bull trend very likely will continue for a while and perhaps could become the biggest bull run of all time. 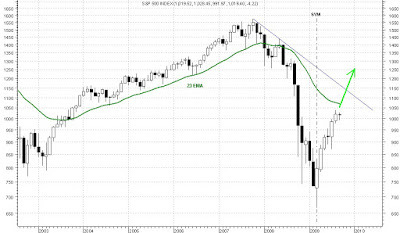 Looking at the monthly chart of SPX below, the index closed August near its recovery high as was expected due to the symmetrical nature of this recovery. The likelihood of this symmetrical up trend continuing is high and SPX reaching 1200 to 1300 by end of this year is a good probability. That is about 18% to 28% gain from here to end of the year. Since March lows it has been difficult if not impossible, to outperform SPX and I think this trend will very likely continue. That's why I chose to put RTS 10 stock strategy on hold for now and go with the indices. Per plan outlined earlier, I put 50% of my capital on the table and bought SPY (60%), QQQQ (20%) and IWM (20%) last Tuesday (9/1/2009) as SPX dropped to 1001 intraday.